I'm now registered for Public Lending Right (PLR). 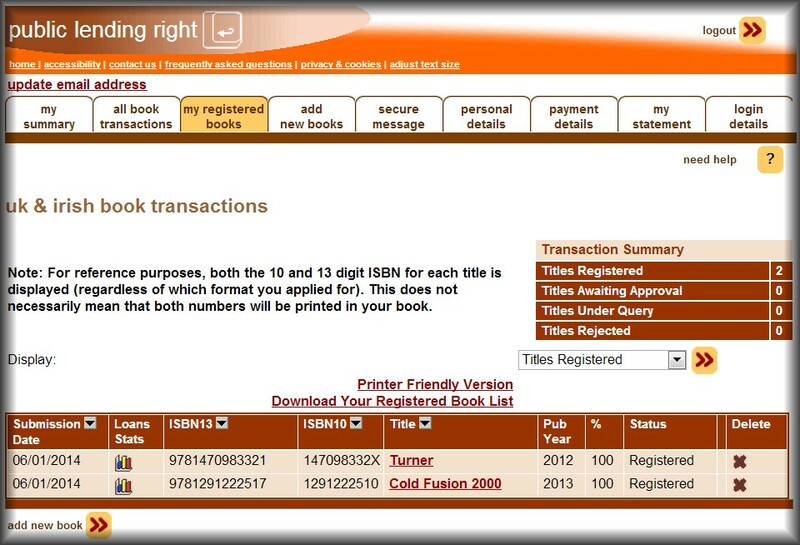 It took a while to organise, since you have to send evidence to the UK PLR office and set up an online account. It now means that if my books were regularly borrowed from public libraries I would get a small annual income from it in lieu of the sales I would otherwise have (possibly) received from readers. The system is a bit clunky, and since I am a wholehearted supporter of libraries it wouldn't even bother me if a PLR system wasn't in place. I don't kid myself that I'll be in a "most borrowed" list (there's an archive of previous lists here). 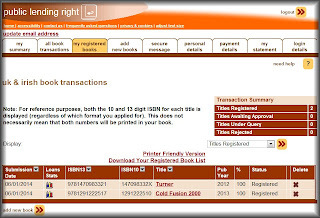 The way it works: each year the PLR staff sample a selection of library authorities, analyse the loan data from the public libraries, then the authors receive payments. The authorities sampled change each time. Ideally my books would be in all UK public libraries so that there is a chance of me being included in the sampling. I had publicised my books to libraries when they came out but most library authorities tend to ignore authors, whereas if a local library member wants a book they usually order it without question, pretty quickly too! So please ask your local library to get a copy of one or both novels - all you need is the author and title (if you have the ISBN it is a bonus, and mine are listed on each book page). If you aren't a member of your local public library, then join up - it is free, and provides you with a wealth of education and entertainment. The following links take you to details of how to join, depending on where you live in the British Isles. I would actually be in favour of doing away with PLR. I think books should be available to libraries without any extra payments needed to authors beyond the original sale. Restrictions and licensing societies are the opposite of making information free, and are focussed only on negativity and mostly-false worries about profits. PLR is a teeny amount that makes little difference and is mostly spent on big-name authors. Do away with it, and the admin, and give the money to libraries instead. They’re closing at a depressing rate. You missed a small step out in the PLR process. They take the loan data from the samples then multiple it up for across the UK. THEN they work out the author payments. You will get a cheque from them one day!